With the beginnning of the reign of Frederick II, the enlightenment came to Prussia. Berlin became the center for research and learning, for art and culture. Frederick was not only a philosopher and patron of the arts, he was an apt politician. It was his greatest desire to make Prussia respected in the German Reich. He had also long planned to extend the borders of his realm. Nobody had taken Prussia under his grandfather and his father very seriously. During the past few months Frederick had not been idle. During the night of December 12/13, 1740, a masked ball was held at the Berlin Palace. The ambassadors and envoys present had not the slightest suspicion, that two hours after midnight Frederick would join his troops, who were already in position close to the Silesian border. This much coveted province of Silesia belonged to Austria. When he reached his troops, he looked around and addressed his generals:" Meine Herren, I am undertaking this campaign with no other Ally but your bravery, with no other source of help but my own luck. Please think of the good name of Prussia, which our forefathers earned on the battlefields.. Go ahead, I will follow you , make haste to the rendezvous of fame!" Frederick made a legal claim on a portion of Silesia. The principality of Jaegerndorf was purchased in 1523 by a younger branch of the Hohenzollern, and in future acquisitions Ratibor and Oppeln were made an inheritance alliance. After the extinction of the Ducal house in 1675, Austria took possession of the inheritance. On December 16, 1740 the Prussian army crossed the border into Silesia. No one could have foreseen, that this first step would lead to three bloody wars over a period of ten years. Wherever the Prussians appeared, the Silesian burghers armed themselves with scythes and other such things, and joined the Prussians in their fight against Austria. How was this possible? Was Frederick not the aggressor? Since the mighty voice of Martin Luther had echoed from Wittenberg throughout Germany and most of Northern Europe, two thirds of Silesia were Protestant. Many of its burghers had been persecuted by the Catholic Church and the courts of the Habsburg. To the people of Silesia, Frederick had become the liberator. In January the Prussian invasion troops took up their winter quarters, hardly a shot had been fired, so surprised had Frederick all of Europe with this bold move. He had smiled when his troops marched into the Silesian capital of Breslau. Why make war? He had come and taken what he wanted to take. But never had Frederick more miscalculated. He had underestimated his opponent: Maria Theresa, the 23 year old daughter of Kaiser Karl VI, Empress of the Austro-Hungarian Empire, was more than a match for Frederick. Frederick went back to Berlin and took part in the Carnival celebrations. But he felt uneasy all through the month of February. There was not one word from Maria Theresa. What this the calm before the storm? At the end of the month he returned to his troops. There were rumors that the Austrian Army was assembling under General Neipperg. March and April saw Silesia in deepest snow. and still no sight of Austrian flags. But the Austrian army was on the march trying to cut off the Prussians. Five kilometers from the town of Mollwitz the two armies came face to face: 18,000 Austrians under the command of Prince Eugen on the one side, on the other 22,500 Prussians, Frederick Wilhelms well exercised troops, but inexperienced in combat. Here at Mollwitz, under his successor, they would have their first baptism of fire. The night before the battle Frederick wrote to Prince August Wilhelm:" Should I fall, you my brother are my only heir". He enclosed greetings to his beloved mother and sister Wilhelmine, who had married the Margraf of Bayreuth. He sealed the letter and the next morning he led his troops against the Austrians. The Austrian cavalry, double in strength of 9000 men, blew over the Prussians like a typhoon. The young king, infected by the panic of his unseasoned troops, fled back on his horse to the spot where general Schwerin was directing the infantry. He told Frederick " Sire, get yourself to safety, I will try to hold our positions with the infantry." This episode distressed Frederick greatly, he felt deep embarrassment. For fifty miles he rode aimlessly until he found a place to stay in the village of Loewen. He had been awake all night, the shame he felt was burned in his soul. He did not know how he would ever face any of his troops. The next morning when his officers finally found him, he learned that the battle of Mollwitz was a Prussian victory. Frederick realized immediately that it was the victory of his father, the Soldier King, a triumph of military drill and the discipline of the Prussian infantry. He never spoke of his behavior at Mollwitz, but he knew that it would never happen again. The cost of victory was high: 1000 dead, 3500 wounded another 1000 were missing. The Austrians had suffered similar losses. So, this was the price of fame! It was a heavy burden to bear. But all of Europe took notice that there was a young King in Prussia whose army had knuckled down the mighty Austrians. No official treaty was signed with Maria Theresa. But France lost no time to convince Frederick to enter into a 15 year agreement on June 4, 1741, whereby both countries, France and Prussia promised to assist the other if they should be attacked by a third party. A decisive secret agreement was reached: Frederick would cast his vote for the Kurfuerst of Bavaria at the next Kaiser election, and renounce for all times his claim on Juelich-Berg in the west of the Reich. For this, France would guarantee Prussia the possession of lower Silesia with Breslau and Glatz for all times. On September 15 French-Bavarian troops occupied Linz, the capital of Upper Austria. Two days later Saxonia joined the French-Bavarian camp. This made Maria Theresa's military and political situation hopeless. Frederick received a secret message from his Prussian military envoy in Bavaria, in which he was informed, that the interest of France is to have three or four nations within the German Reich, but none of them too powerful to be a threat to France. This touched a nerve in Frederick. So, he made a complete 180 degree turn, meeting in all secrecy with the Austrian General Neipperg, whom he promised not to interfere with Austria, so that the Austrian army could defend itself against Bavaria and France ( his Allies ) without having to worry about Prussia. England's special envoy, Lord Hynford was also present at this meeting. Nothing was put in writing. It was a discussion where only verbal promises were made. It was incredible! Frederick had of course a good reason for his unscrupulous behavior: Should Austria be victorious, Maria Theresa would then perhaps be more reasonable about Silesia. While all this wheeling and dealing between the nations of Europe continued, Frederick returned to Berlin in November. The Prussian capital was eager to celebrate and glad to have the King at home. He declared that carnival would start already in December, and one grand ball followed the other. In the middle of January 1742 Frederick took a long look at the situation: the Allies, France, Saxony and Bavaria would soon be in a defensive position, as Austria had now three war-seasoned army to her disposal, and Hungary provided concentrated massive support to Vienna. Frederick went to Dresden to hatch a plan with the son of August. But the Kurfuerst of Saxony was wrapped up in trivial, unimportant things, so Frederick left for home. On January 24, Frederick's birthday, the Bavarian Kurfuerst Karl Albert was crowned as German Kaiser in Frankfurt on the river Main, and took henceforth the name Karl VII. Frederick, forever striving for a balance between the power of European nations, told the French Ambassador de Valory "A long war is not what I have in mind, and if France does not post-haste honor its commitment, you can depend on me like on the leaves in November!" Frederick had no longer any illusions about Maria Theresa, the day before the crowning of the Kaiser in Frankfurt, her troops had stormed the city of Linz. On every front the Austrian Army was victorious. Should the Austrians, as it seemed, to get the upper hand over the French and their German Allies, Silesia would be lost to him. He decided to re-enter the war and surprise the Austrians, while they were engaged in South Bavaria and West Bohemia. The spearhead into Maehren took place with 30000 men, Olmuetz was occupied and the fortress of Bruenn encircled. The Prussian Husars under Generalmajor von Ziethen got as far as Stockerau, the last post station before Vienna. There they fought with Hungarians and Croats who were camped out at the city gates. It was different here than with the Protestant people of Silesia. The fanatically catholic population of Maehren refused to provide the Prussians with horse feed, hay, and straw, as well as food for the soldiers. The Prussian army magazine was not as well stocked as Frederick had expected, and no matter who was at fault, the position in Maehren could not be held under these conditions. The Prussian army was ordered back into Bohemia. Maria Theresa cried joyful tears when she heard of the retreat. Vienna was safe! It would not fall into the hands of this Prussian heretic! Frederick halted the troops in Bohemia at the river Elbe. His anger fell on Saxony; the Saxons had failed to provide the canons they had promised. The Saxon envoy von Buelow asked Frederick:" Sire, how will my Lord, Kurfuerst August obtain the crown of Maehren now? Frederick icily answered" Crowns are won with canons." Frederick was war-weary by now, he longed to be in Rheinsberg and Charlottenburg. All his thoughts were with the building of the new opera house, he had commissioned to be constructed in Berlin.. How could he bring this awful war to an end, this war, which he alone had started in 1740? As yet no one has realized that this King was most dangerous when things went wrong. The Austrians would have been well advised not to move against him in this situation. By now they had occupied Munich, and every where they were busy to rout the French and their attached regiments. Maria Theresa wanted revenge for Mollwitz, and the Austrians nearly pulled it off. 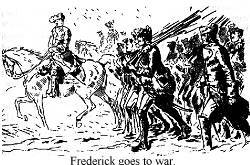 They surprised Frederick on Sunday, May 17, 1742, his army splintered in three different camps. But Prince Karl maneuvered his men so clumsily, that Frederick could get his troops together at the village of Chotusitz. 30000 Austrians in their white uniforms met 25000 Prussians in Blue. The Prussian cavalry attacked first with their swords high in the air. They broke through the Austrian lines, but on the left side all went wrong. Here the Prussians were outnumbered 2 to 1. Many turned and tried to get back behind their lines, when suddenly a single black-clad rider galloped among them:" Halt, brothers, stay put" he yelled. Now the Prussians recognized the man on the little horse: It was their field padre, their Protestant minister. "Jawohl, Herr Pfarrer" they called back, turned around, and attacked the Austrians with a renewed ferociousness. Twice more the Prussians had to turn back, and twice more the Padre Seegebarth fired them on and gave them new courage. Never in military history has such a thing happened. When the wing of the Prussians attacked for the fourth time, they broke the Austrian lines. Frederick had held the infantry back, and when the Austrians saw the Prussians marching towards them, their flags fluttering above them, their drums beating a monotone rhythm, their will to fight on completely broke down. This too was the victory of the father, the soldier King. Chotusitz was the second victory over the Austrians. While all of Europe wondered if the young man from Berlin was truly unbeatable, Frederick quickly took the political initiative. One day after the battle he told his minister Podewils, who was in Breslau, to get in touch with Lord Hynford and through him to start negotiations with Maria Theresa. The French, Saxons and Bavarians beseeched Frederick to follow the army of the retreating Prince Karl, now would be the time to destroy the House of Hapsburg. Frederick would not hear of it. Already on June 11, preliminaries for a peace treaty were conducted in Breslau. Frederick told his generals on June 15. Everybody congratulated him, he lifted his glass and drank a toast to the health of the Queen of Hungary, Maria Theresa , as well as to her brother-in law, the defeated Prince Karl. On July 28, the formal signing of the peace treaty between the two countries took place in Berlin. For Maria Theresa it was a sad end to the war. She had considered Silesia the jewel in her crown. In England, Prime Minister Lord Walpole, called the Prussian King " the man who is holding Europe's balance in his hands," but in Paris and Versailles they called him a traitor, who had deserted his Allies. But what could they do? One false word and they would throw Prussia into the arms of Austria. The French envoy, the Marquis de Valory, told Frederick how betrayed his country felt, because he had broken the pact, and because he had gotten out of the war. Frederick let him finish, then with his voice raised, his blue eyes flashing, he countered "Where were the French when they were to support me with much needed weapons in Bohemia? Where? You are standing with your main force in Westfalen! Apparently you French want to play Lord and Master in Germany! Well, Sir, I am a German Prince, and I will never permit that to happen." In July 1742 Frederick was back in Berlin. In September he traveled to Silesia to see for himself how it best could be administrated. In December the opera house opened, and in his next birthday, January 24, 1743, the first session took place in the Academy of Sciences, which had been founded by his grandmother Sophie-Charlotte. It had been Frederick's dearest wish to re-open this institution. In the spring of 43 the announcement was made that every burgher, rich or poor, could in writing or in person lay his requests before the King. One year later he set aside a time in his busy work day to deal with the affairs of the people. Frederick tried to stay clear of any military involvement, if at all possible. He decided to become more active in politics. In his view the German Reich was nothing but a phantom of the past. Where could he find a true Ally who would be able to keep Austria in check? In January he intervened of behalf of the fourteen year old Princess Sophie of Anhalt-Zerbst, whose father was a high ranking Prussian officer. The Russian Tsarina Elizabeth, daughter of Peter the Great, was looking for a wife for her nephew and heir, Duke Peter. Through his ambassador he was able to turn the interest in St. Petersburg towards Sophie. It was a successful intervention. Sophie left with her mother for Russia and married the Grand Duke Peter. Twenty years later she would play an important role in European politics as the Empress Catherine II. To win Russia over, Frederick was prepared to do almost anything. The Tsarina Elizabeth wanted a marriage between the heir to the throne of Sweden and a Prussian Princess, and Frederick gladly agreed that his sister Ulrike should be the one. But nothing changed very much in foreign politics; Russia soon allied itself to Austria, and Sweden remained under Russia's thumb. Frederick still yearned to recapture the carefree times of Rheinsberg. 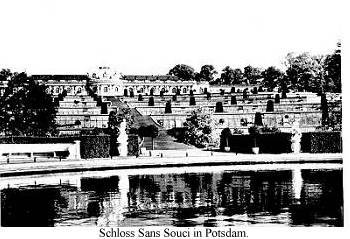 In 1745 he commissioned the well-known architect Georg von Knobelsdorff to build a one-story Rococo style Palace in Potsdam, which he called "Sans Souci"
Frederick's hope for Russia and Sweden had failed, England had only one desire: to weaken France and to make Austria stronger. His conception of an armed neutrality within the Reich had turned out to be a mirage. So, it was war and blood shedding again. His one and only goal was the security of Silesia, which had cost him so much in human lives.
. On January 8, 1745 Frederick received a big blow: Austria, Saxonia, England and Holland had formed a quadruple Alliance, with the blessing of the Tsarina Elizabeth. Frederick knew that this Alliance had little to do with ensuring the peace in Europe, and it had everything to do with reducing the power of the Prussian King. On January 20 the news reached Potsdam that Kaiser Karl VII had died. Prussia stood alone, with Frederick branded the sole mischief-maker within the German Reich. It was at this time, that Frederick set his earlier ambitions aside. To conquer new territories was out of the question, in fact not only was Silesia endangered, but the very existence of Prussia itself. These thoughts were overwhelming, but it was his private agony. To be sure, Frederick was down, but not out. At the end of May the combined armies of Austrian and Saxon soldiers, numbering 65000 men were in readiness at the Silesian mountain passes. It was their aim to capture the fortress of Schweidnitz, and then to begin their offensive against the city of Breslau, the capital of Silesia. Maria Theresa was determined to re-capture the lost province. During the past ten weeks Frederick had worked tireless to re-new the fighting spirits of his men. With hard determination he concentrated his army of 50000 men in the vicinity of Schweidnitz on June 1. The next day Frederick watched from his position the moves of his enemies: Some left the mountain passes and got down into the Silesian flat lands. On June 3 they camped in a half circle west of the town of Striegau. Frederick watched the surrounding terrain very carefully: to the left was Hohenfriedberg. He saw more and more Allied soldiers leaving the mountain passes behind. " Have a good trip! " he was heard mumbling to himself. When darkness fell, he gave the order to his regiments to march towards Striegau. The camp fires were left burning near Schweidnitz, and several soldiers ran back and forth to keep them burning. The troops marched in ghostly quiet, no one talked or smoked, and rags had been put around the horses hoofs to muffle their sound. In the early morning the right wing of the Prussians attacked the Saxons, who, completely taken by surprise, defended themselves heroically. By seven o'clock in the morning 3000 Saxons lay dead or wounded on the battle field. The Prussian cavalry decided the battle for Frederick. The enemy fled back into the mountains. Hohenfriedberg was the greatest victory so far, not only because of the bravery of his men, but also because Frederick had developed an uncanny ability to evaluate the situation, and to move at the precise right moment under cover of darkness, taking full advantage of the element of surprise. The Silesian population who had heard the thunder of the battle had prayed for a Prussian victory. Two days later a couple of thousand farmers showed up and asked for permission to beat to death every Catholic in the land. Frederick smiled and said: " The bible tells us to love our enemies and to bless those who curse us." That convinced the farmers and they all returned peacefully to their homes. Two of his Frederick's closest friends died while he was engaged in battle. The sudden death of Jordan and of Keyserlingk hit him hard. He grieved openly and it showed a side of Frederick few people would ever see. The end of September saw Frederick marching in Silesia, with the Austrians and Saxons close on his heels. Peace was still elusive, with Maria Theresa telling the British envoy, that she would sooner let go of her petticoat than of Silesia. It came to another confrontation on September 30, 1745 at the town of Soor. The battle was won by the Prussians, but with great losses. 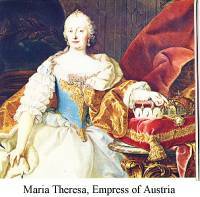 Austria too had enormous losses, but still, Maria Theresa would not give in. At this time the Tsarina Elizabeth tried to intervene with Vienna , and through her envoy let Frederick know, that a Prussian offensive against Saxonia's army and the city of Dresden would be considered a provocation against Russia. This was exactly the wrong approach to take with Frederick. To be sure, he feared nothing more than a confrontation with Russia. So, he played the waiting game. Then the Austrian army marched into the province of Lausitz. A two hour battle at the village of Hennersdorf was a Prussian victory. Next came the fight at Kesselsdorf, and at five o'clock in the afternoon everything was over. Prussia mourned another 4800 dead and wounded. On December 18 the Prussian army marched into Dresden. The people were jubilant, here too religion was a factor. Most of them were Protestant and had never forgiven their own reigning House for embracing the Catholic religion. Prussia was almost bankrupt and Frederick needed a peaceful settlement desperately. On December 25, 1745 a treaty was signed between Prussia, Austria and Saxonia. Maria Theresa got her dearest wish, the Kaiser crown for her husband, as Kaiser Franz I, and Frederick recognized Maria Theresa as Queen- Empress. Saxonia paid Prussia one Million Talers, and all Prussian soldiers left Saxonia. Frederick kept Silesia. On December 27 he left Dresden for Berlin. On his way back home he was in a reflective mood: It had been five years since he has set out for his rendezvous with fame. Of these five years, three were war years. He was victorious in five big battles, but he had come close to ruin and destruction. The name of Prussia was now known in Europe, and henceforth there were two powers within the German Reich: Austria and Prussia. The Prussian capital was ablaze with festive lighting. Every where people shouted "Vivat Friedrich der Grosse!" Frederick got out of his carriage at the palace entrance, lifted his tricorne and bowed to the people who had come en-masse to welcome him back.